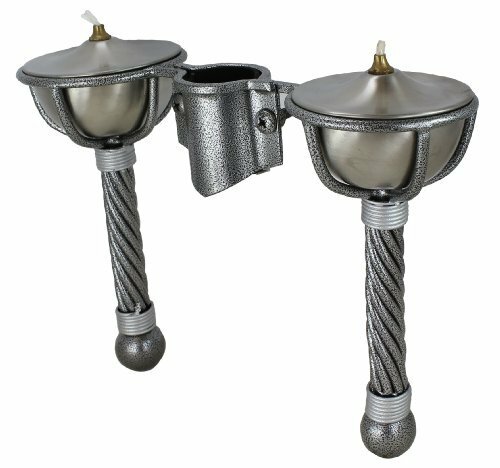 Umbrella & Pole Attachable Tiki Torches - 2-Torches by Regency Creations at Rodale Institute Store. MPN: 225712. Hurry! Limited time offer. Offer valid only while supplies last. This 2-Torch attachment holds snugly and securely to your umbrella pole or railing. Sit-in stainiless steel bowls are removable for easy filling. This 2-Torch attachment holds snugly and securely to your umbrella pole or railing. Sit-in stainiless steel bowls are removable for easy filling. Screw-in wick holder is easy to adjust and fill oil. (oil not included). 2 wicks inlcluded. Foam rubber grip helps attachement to hold firmly to pole. Simple to use and easy to set-up! Perfect addition to your patio, dock, porch and more! If you have any questions about this product by Regency Creations, contact us by completing and submitting the form below. If you are looking for a specif part number, please include it with your message.